David Dolling will step down from his position August 31 after serving as the dean of the School of Applied Science and Engineering for 10 years. Updated: June 11, 2018 at 2:06 p.m.
David Dolling arrived at GW on a mission to expand the School of Engineering and Applied Science. A decade later and just two months away from Dolling’s last day as dean, the engineering school has swelled in size, research projects and fundraising efforts, faculty members said. Dolling announced in May that he will step down from his position Aug. 31 and go on sabbatical leave next academic year. Engineering professors said Dolling served as a visionary leader during his tenure, revolutionizing the school into a nationally ranked institution by leading the construction of the Science and Engineering Hall and expanding research opportunities. Dolling will return to GW as a professor and will teach engineering students. 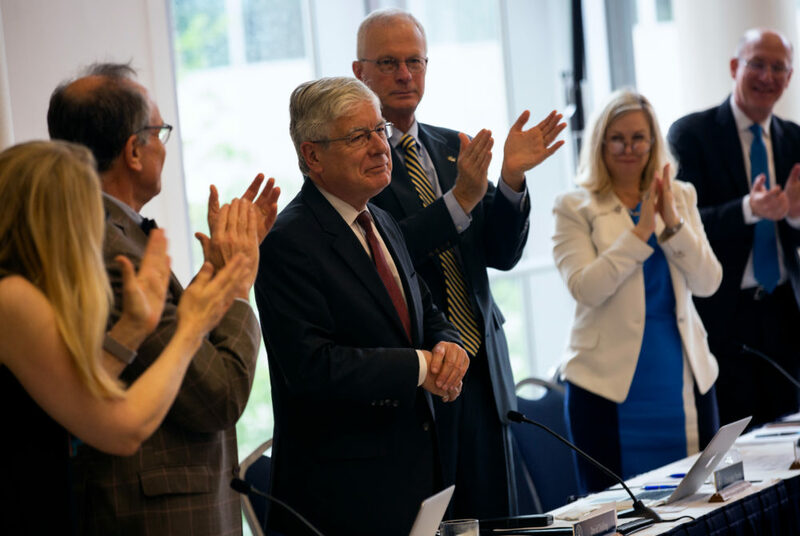 “I am delighted to have the opportunity to return to the classroom, re-establish a research program, and be of service to SEAS and GW and the broader technical community,” he said. The University named Rumana Riffat, the associate dean for academic affairs in SEAS, as interim leader of the school last month, though details have not yet been announced regarding a permanent dean search. Serving as the dean since 2008, Dolling helped to oversee a $275 million endeavor to build the Science and Engineering Hall between 2011 and 2014 – a project that caused the school to ramp up fundraising efforts and increase outreach to donors. Dolling also led the creation of the biomedical engineering department in 2014 and oversaw the development of the Clark Engineering Scholars program in 2011, which awards dozens of SEAS students financial and networking opportunities each year. “Of course, with the completion of the SEH, we have a tremendous new facility that helps enable our continued accomplishments, particularly in research,” he said. Dolling said that nearly 60 engineering faculty members were added over the last decade, while an increase in donations funded three endowed professorships. He also worked to bridge the school’s gender gap and brought in more tenured faculty focused on improving the University’s research profile. Prior to coming to GW, Dolling served as the associate dean for academic affairs and the chair of the aerospace engineering department at the University of Texas at Austin. He also earned a doctorate degree in aerospace engineering from London University. But during his time leading the helm, Dolling also faced several challenges, including a lawsuit against the engineering school for allegedly failing to notify a retiring professor about an upcoming buyout program. Fundraising efforts to support the construction of SEH also stalled for months, prompting community concerns about how GW would support its most expensive real estate project. Dolling declined to say what challenges he encountered serving as dean and how he overcame them. Faculty in the engineering school said Dolling’s fundraising and leadership skills, alongside his focus on research, fostered a productive atmosphere in SEAS for faculty and staff. Joost Santos, an associate professor of engineering, said Dolling’s supportive approach to financially supporting students by creating scholarships, in addition to his work to get a new undergraduate systems engineering program accredited, has improved SEAS from a national ranking standpoint. SEAS currently ranks as the 86th-best engineering school in the country, a higher ranking than when Dolling began his tenure, according to U.S. News and World Report. David Nagel, a research engineering professor, said Dolling’s transparent communication with faculty and students through weekly newsletters and emails and his collaboration with the research office at GW resulted in a more effective system for research proposals and proper lab space. Jason Zara, an associate engineering professor, said he worked closely with Dolling to recruit undergraduates to the school and establish the biomedical engineering department at GW in 2014. Dolling was focused on building the SEAS community which formed a space where students and faculty could openly exchange ideas, he said. The Hatchet incorrectly reported that Dolling served as the chair of the engineering program at the University of Texas at Austin. He was the chair of the aerospace engineering department. The post was also updated to clarify language about Dolling’s work to get a new engineering program accredited.